Women’s lacrosse coaches have made a proposal to the NCAA to limit early recruiting of younger students. Duke head coach Kerstin Kimel has been among the more vocal proponents of the limits, which could include banning contact with recruits until Sept. 1 of their junior year in high school. Foothill coach Kate Hick, who earned All-American honors as a player under Kimel at Duke, has seen the issue from all sides — as a high school player, a college coach at Pepperdine and now a high school coach. 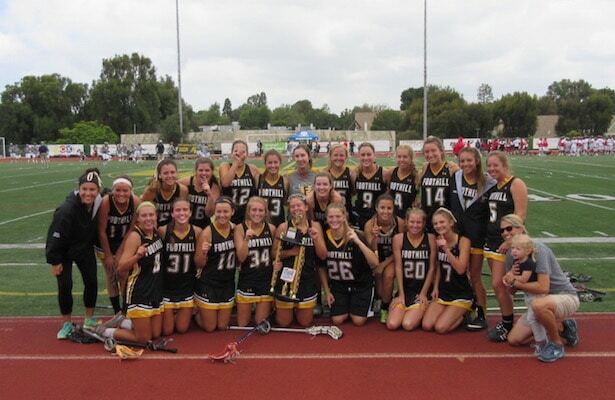 Last spring, Hick coached Foothill to the CIF Southern Section championship, with USC signee Hannah Upshaw in net. “I’ve been very aware of this issue, especially with my coach, Kerstin Kimel from Duke, leading the charge from the women’s lacrosse side, and am in full support of the changes they are proposing. I support this initiative, because if I was a high school student today, my recruiting story would never have happened. I grew up in Pennsylvania and started playing organized lacrosse in 7th grade but had no aspirations to play in college. I never went to a camp, never joined a club program (which they didn’t have back then), or sent a video of me playing. My junior year in high school I was named a high school All-American and was invited to a tournament, which turned out to be a recruiting tournament, in Annapolis, Maryland. From this one tournament I started getting recruited. To say the least, I was lucky. I was lucky to have been recruited in 1996, not 2015. While I was at Duke, I started to see things change in the recruiting process, and not necessarily for the better. A lot of players who committed early didn’t pan out, because they either peaked when they were recruited as freshmen and sophomores and weren’t able to make the jump to college; or they got injured before they reached their senior year in high school. Consequently, colleges were left with over-hyped and over-invested recruits; girls quit because they couldn’t hang; and worst of all: players who peaked their senior — or in my case my junior — year would have been better fits but weren’t given the opportunity they deserved. I don’t care how good an 8th grader is — you need to see these players mature in the game physically, emotionally, and then start recruiting. I was ready to be recruited as a junior and understood more about my future as a senior than I would have as a freshman. Now that I’ve become involved Southern California lacrosse I am even more concerned about early recruitment. Unlike their east coast counterparts, girls in our area are picking up lacrosse later, and by the time they are ready to be recruited, the majority of the top schools already have decided their future classes. Where does that leave our girls? From what I’ve seen, they are relegated to second- and third-tier schools where they either play on not-very-successful teams, club programs or stop playing lacrosse altogether. And as this cycle continues, lacrosse will stay stagnant here in Southern California. I mean, what will be the point of high school careers, club programs and other recruiting tools, if the top schools will always be out of reach? If it was a fair playing field, Southern California girls could learn the sport, play it and be given a real opportunity to play at the higher level. When that happens, lacrosse will improve here. So, what can we do? The recruiting needs to start junior year, like it did in my day, and girls need to get into lacrosse sooner. They need to enter that junior year on the same playing field with everyone in the nation. Then it won’t matter where they are from, but coaches can actually recruit the best players. Therefore, coaching at the high school level needs to improve so there isn’t the wide geographic difference in kids being ready to play at the college level. I know that’s hard right now, but in order for these kids to get recruited, they need to have the right tools. In addition, club teams need to improve, and once they start getting some kids recruited to top teams, the conduit will start being open. I think the #DUKEvsUSC game will hopefully inspire everyone to get involved. We as an area have a lot of work to do. But this game, played at the higher level, is amazing and something girls should aspire to play like. I hope it inspires coaches to learn more about the game and honor it by coaching the correct mechanics. I hope it educates parents on what the game should look like, and what a club program should be emulating. And yes, lastly, I hope it brings some attention to this issue and that it highlights areas like Orange County, who have been casualties of this early recruiting.